This past Sunday, Cornelius and I, along with a couple of friends, went on a bike ride to Burnaby which is the city right next to Vancouver. It’s all nicely connected along the Central Valley Greenway trail, much of it off road or on quiet ones, so it made for a lovely ride on a hot summer day. We arrived at Deer Lake, our destination where we walked around the lake trail and found ourselves a nice little picnic spot under a shade tree. It hit me that this was my first picnic of the year. In our panniers we packed a gigantic focaccia deli sandwich split 4 ways from La Grotta Del Formaggio, cold beers and a ritter sport bar for extra energy. It wasn’t a fancy picnic but it was perfect. It was also a reminder that OMG August is here and summer better not slip away! I haven’t even gone camping yet which seems crazy. So I’m vowing to have more picnics, more bike rides, more hikes in cool forests, and a jump in a lake would be nice too. This here, this bright yolk, isn’t picnic food. At least, it wasn’t a part of mine & due to its delicate nature, it’s probably best eaten at your kitchen table or a few feet outside your back door. I made this recently because I was spending another glorious summer morning working. Instead of going to an office, though, I work from home. So it was easy to say “enough is enough, time for brunch”. Why relegate brunch to lazy weekends? What about when you’ve already downed 2 cups of coffee and it’s not quite noon yet and you’re starving. That was me. And this was my solution. A very delicious brunch solution. I didn’t have anything planned, but it was easy enough to throw together with what already existed in the fridge. Whole wheat pitas. Fresh local basil from the market. A nub of havarti that I grated until it was gone. An egg with an amazingly bright yolk. You might consider it bad form to turn on the oven in the middle of summer, but it’s only the broiler which takes no time at all to heat up, plus I had the fan going. About 6 minutes later, my weekday brunch was ready. Contrary to popular opinion, I suggest a light hand with the cheese. Not too much is my motto here. You don’t want things too gooey – the yolk will provide a nice slick ooze that is utterly delightful, so you don’t want a thick layer of cheese messing things up. Just trust me here. Or find out for yourself because I’m sure this is something that you’ll turn to again and again when you’re jonesing for a quick breakfast. A fast lunch. A lazy dinner. Or you know, a fancy brunch. Don’t forget a splash of hot sauce! Walk away from your computer, find a shady spot on your balcony/yard/patio and it’s almost like you’ve got a brunch-time picnic going on. And on a Wednesday even. Summer is still here, take advantage! I think spinach would do fine if you don’t have basil, but keep it simple. Maybe a scattering of chives. And please do keep a light hand with the cheese, trust me, it’s better that way. Place pita on a baking sheet, if your pita is slightly bowl shaped, make sure the bowl faces up as you want an edge to hold in the egg. Sprinkle pita with grated cheese. 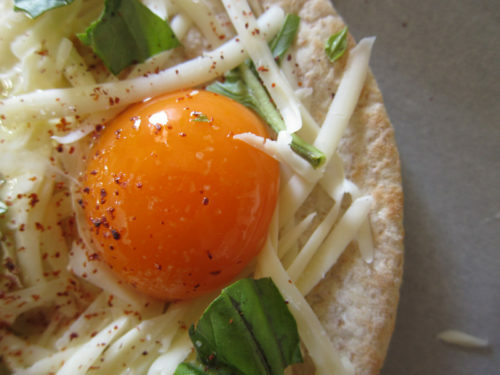 Crack an egg and gently plop it into the middle of your pita. Scatter basil over top and sprinkle with salt & aleppo pepper. Pop into the top rack of your oven right under the broiler. Or if you’ve got an old gas oven, you know where your broiler is (if you don’t, it’s that thing that looks like a bottom drawer). Bake for about 5-7 minutes. 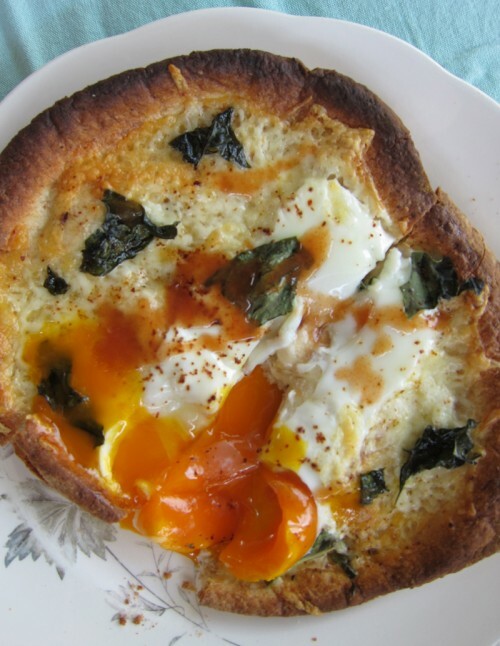 Egg yolk should be runny. Eat and repeat as necessary. I definitely need to make these for a brunch (and just for myself of course)…gotta love anything with cheese and runny yolk! Looks gorgeous, and I think the spinach would be perfect. I used to get an egg and spinach sandwich from a local Italian deli when I worked in the West End of London. It had some seasoning in it, other than salt and pepper but I can’t remember what it was. Maybe onion as well. 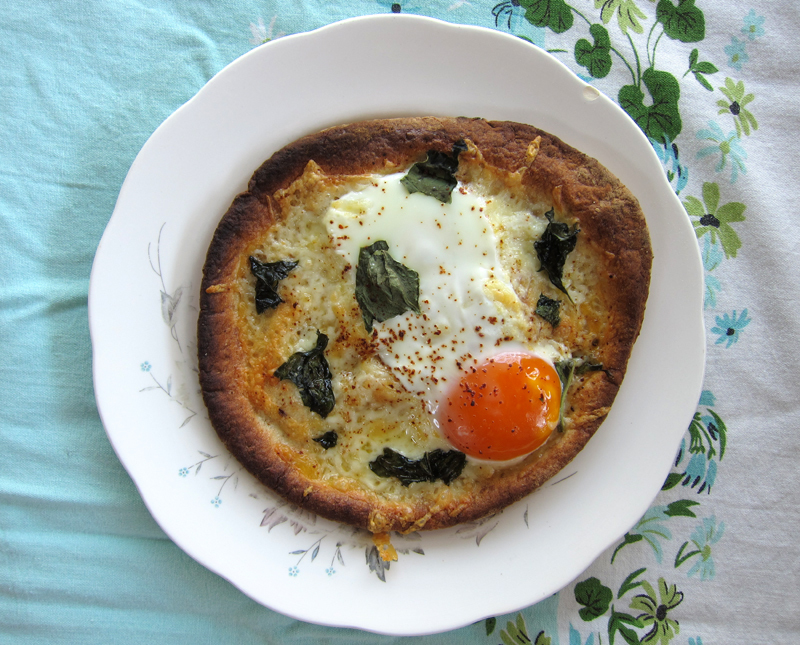 Of course spinach and cheese is wonderful together, especially in a buckwheat crepe. This looks like such a fun, easy, idea! What a great quick meal! I love making pizzas with pita – I’ll have to try a brunch version! Joanne, I’m sure you’ll love this – it’s so quick to put together and they’re quite addictive! Catherine, yes, spinach I think would be great. There’s a food truck that makes buckwheat crepes here and they’re fantastic. Mmmmm. Agreed, Nicole. I love how some yolks just scream out their beauty. I hope there will be more picnics too. Bike rides are easy since it’s besides walking, it’s my main form of transport. Amanda, pita pizzas are my “i’m alone, i’m hungry” snack or meal, so I’m quite familiar with them! But the egg version is extra special. Enjoy! I love this topping. That egg yolk is such a gorgeous deep yellow. Egg and greens is such a great combination on pizza or anything for that matter :). Here’s to many more long summer days out before it slips away! This looks great, I’ll have to get some pita and try it this weekend. Hi – I saw this yesterday and I had to make it this morning since I had all those ingredients. It was delish – I added a couple of slices of prosciutto 🙂 nice and salty! It was sooo good! Thanks! This looks great! I also work from home and lunch is more often than not spent in front of the computer but I’m taking your advice today and eating lunch in the backyard, with a jacket on since it is summer in the SF Bay area after all! 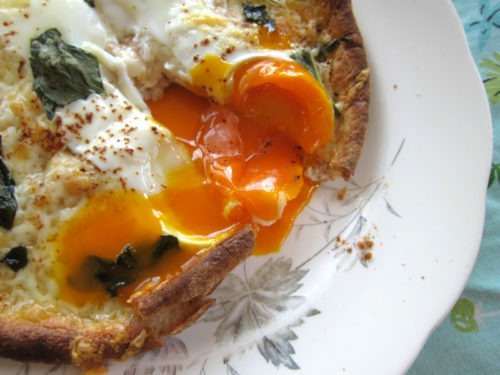 Who could ever turn down a gooey, drippy egg? Not I! Your bike ride sounds glorious, and this brunch is one I have to make ASAP. Thanks, Caz, here’s to more of summer!!! Adventures await!! Thanks Elizabeth, I hope you give this a try. Lisa, so glad you enjoyed it. I’m sure it was fantastic with the prosciutto!! Yum. Shawna, so true isn’t it. Working from home should give us more freedom, so I’m glad you took a break outside for your lunch today. I’m totally with you on not too much cheese with this kind of thing. That way, the pita stays nice and crisp. I’m going to pick up some pita today so that we can try this over the weekend. The littlest member of our family is crazy for eggs and pizza. She may not know what to do with herself when we put the two together. Happy weekend to you! This food brings back memories and it’s making me hungry. I used to make a similar ‘egg pita pizza’ but I’d pile on the mozzarella cheese. Took me quite a while to get everything cooked just right. You’re right about it not needed tons of cheese. Wish I had thought about the basil. Next time I will make it according to your instructions. Thanks for the reminder. I’d like to try this on garlic naan. Thanks for the idea! I don’t know why I’ve never stumbled across your blog before! 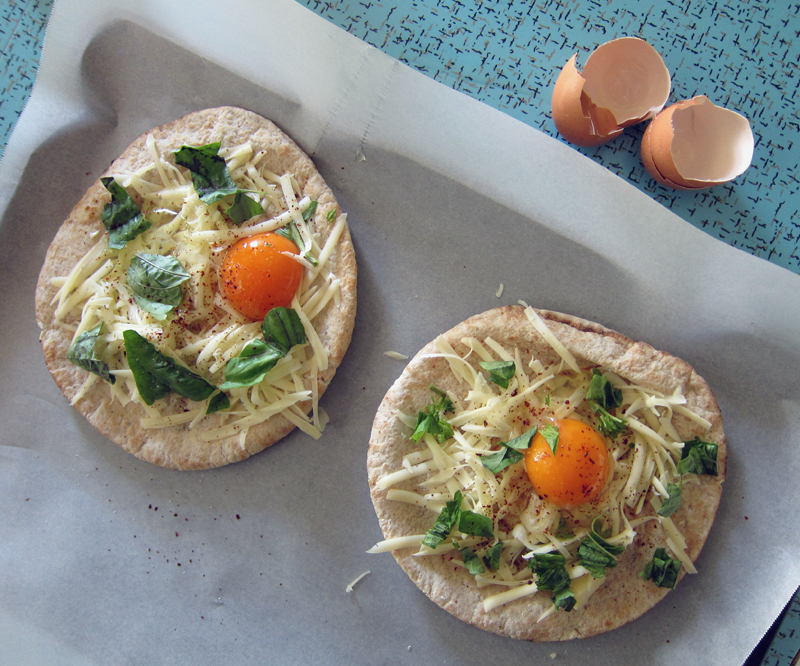 It’s absolutely lovely, as are these little egg pita pizzas. Gotta love runny yolk. This looks fabulous! 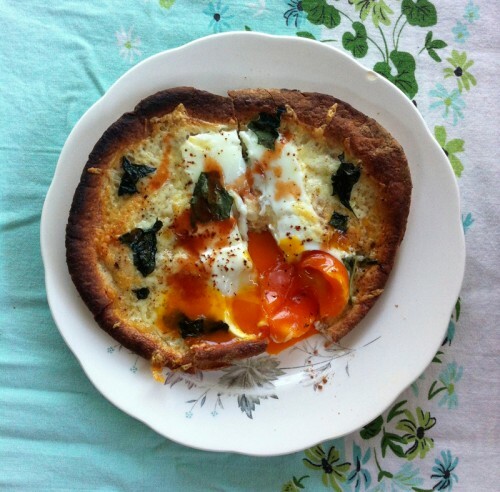 I love the idea of pizza for breakfast – complete with the perfect runny egg! That looks delicious…look at the colour of that yolk! Where do you get your eggs? What a great quick brunch/breakfast idea! I only wish I had some pita in my house and I would be making it tomorrow morning. 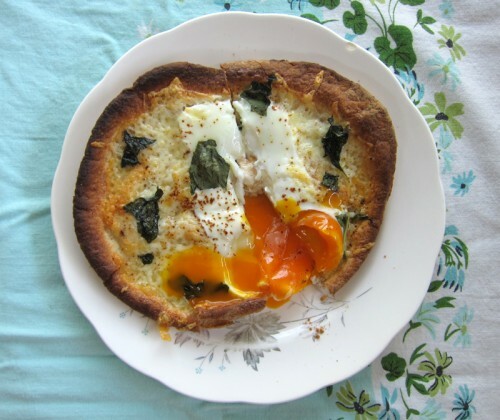 I love trying diffrent kind of pizza – i eat pizza with eggs but never on pita pastry! Yes, Jess, the crispiness is a huge factor on not adding enough cheese. Hope your littlest enjoys this one! Nothing doin’, Bijoux! Hope you try this again! Holly, I think that would be smashing! Thanks Irina for stopping by! Yes, Melanie, I’m with you on the runny egg. Hag, I get my eggs all over the place 🙂 Either at Santa Barbara, Bosa on Victoria or Gourmet Warehouse (I guess the closest shops near to me). They’re free run eggs, not usually organic though sometimes I’ll splurge on organic ones. Erica, looks delicious! Thanks for the recipe. I loved this recipe! I added just a smidgen of feta and this was delicious, I would eat it any time and so easy.